56 J A N U A R Y 2 0 1 8 w w w . C A N A D I A N L a w y e r m a g . c o m Instrumental in conducting change. CANADA & USA 1.800.265.8381 | EMAIL info@mckellar.com | www.mckellar.com Advocacy—it's what leaders do. 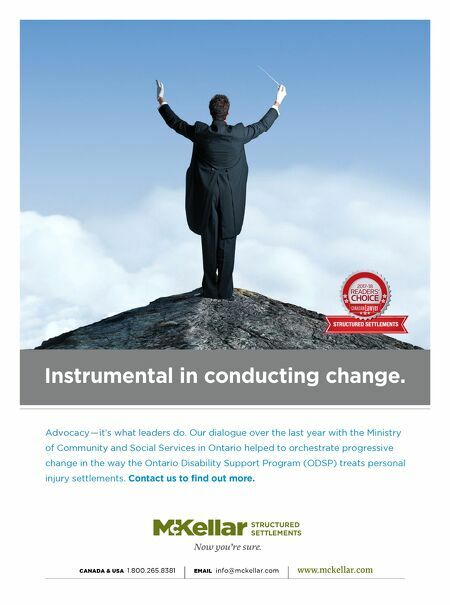 Our dialogue over the last year with the Ministry of Community and Social Services in Ontario helped to orchestrate progressive change in the way the Ontario Disability Support Program (ODSP) treats personal injury settlements. Contact us to find out more.